Thank you so much for sharing this. We just lost our baby boy last Wednesday. Emmanuel had Trisomy 18 and lived for 1 hour 40 minutes. Sorry for your lost. Thanks again for making this information accessible. I love the name Emmanuel. I am sorry for your loss. I know that every moment you spent with him is treasured. I’m glad the site was able to help you in some way. Thank you for sharing Dakar’s obituary. 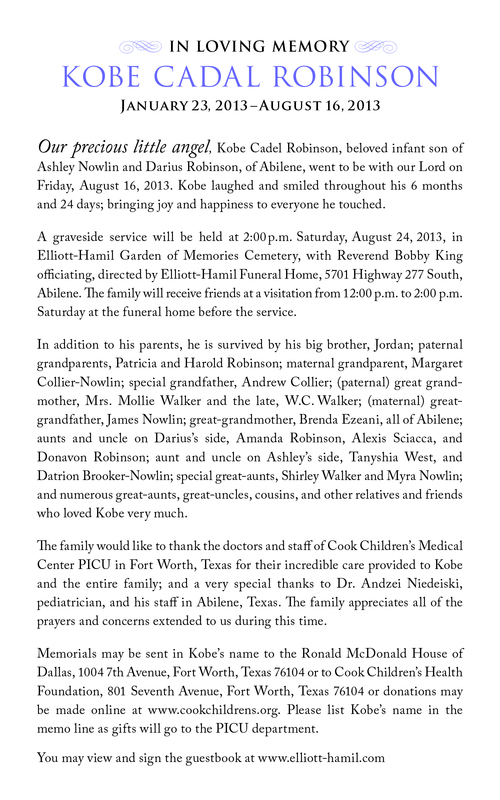 This is a very difficult time for all involved and your sharing something as personal as your obituary was heartfelt. You should now that Dakar will be in everyone’s hearts that have used your words as guidance for their loved one’s departure. I am writing an obituary for one of my grandson’s who passed away 2 days after birth. He has a surviving twin brother. Thank you so much for sharing this. I too am searching the web for a guideline that doesn’t exist. My husband and I lost our daughter after three short days from a cord injury. I am sorry that you have experienced a loss as well. Thanks again for making this information accessible.